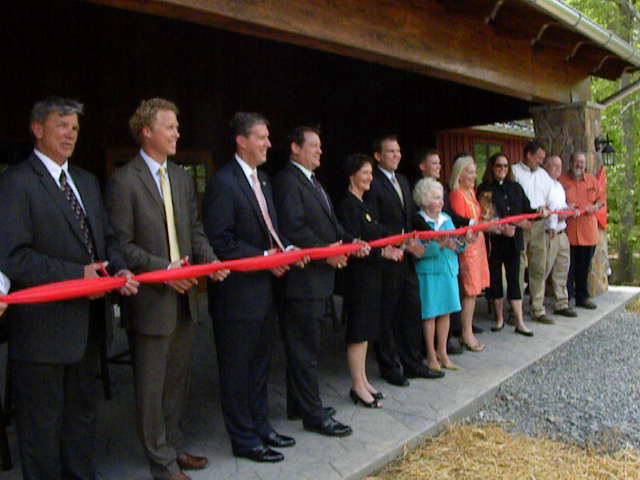 Proprietor Kirk Wiles welcomes Secretary of Agriculture and Forestry Todd Haymore and other dignitaries to celebrate the opening of the new tasting facility at Paradise Springs Winery. The winery is located in Clifton Virginia and last year received the Governors Cup for White Wines for their 2009 Chardonnay. We featured Kirk and Paradise Springs in our inaugural episode of Virginia Wine TV. The video embedded below features Patrick Cushing introducing Secretary of Agriculture and Forestry Todd Haymore as well as Mr. Wiles discussing the new facility. There were also many wine writers and bloggers in attendance. Please check out Virginia Wine Time and Wine About Virginia for excellent photos and commentary.